July 30 marks the 50th anniversary of the establishment of Medicare. 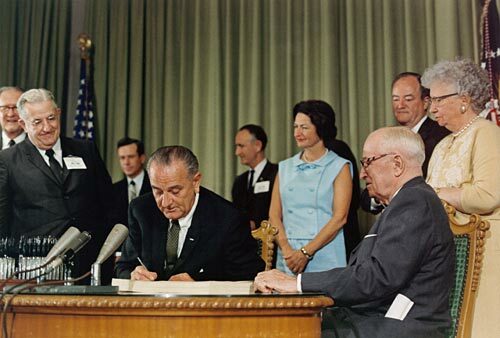 But getting to the signing of the Social Security Amendment of 1965, which created Medicare, was a long road. In the 1910s and 1920s, numerous reports, recommendations, and programs advocated the development of a national health system, especially after the United Kingdom adopted National Health Insurance in 1911. Due to opposition from the American Medical Association (AMA), labor unions, and insurance companies these recommendations were never fully accepted. However, there was consensus that something needed to do be done to protect the poor from the burden of healthcare costs. From: Foster WT, U.S. Public Health Service. 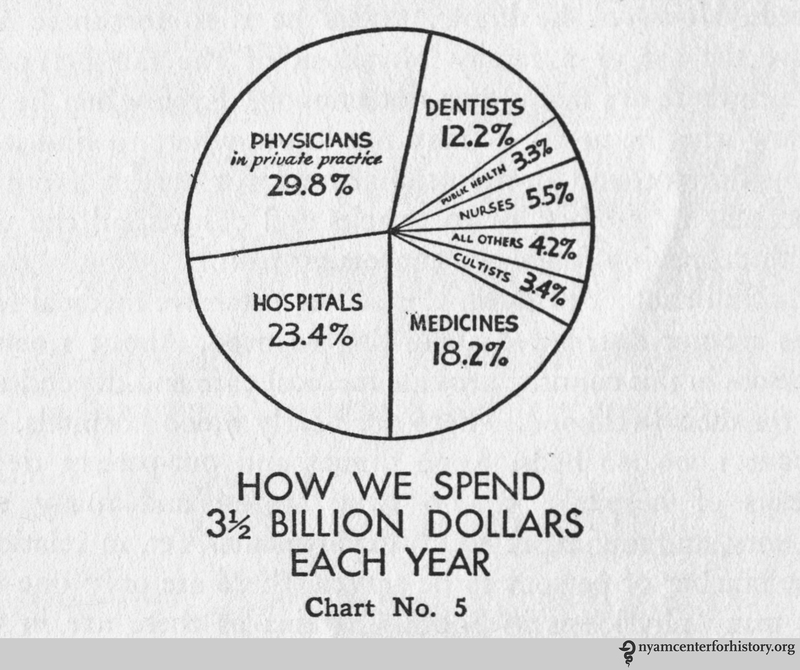 Doctors, dollars, and disease. [New York]: Public Affairs Committee, Inc.; 1937. 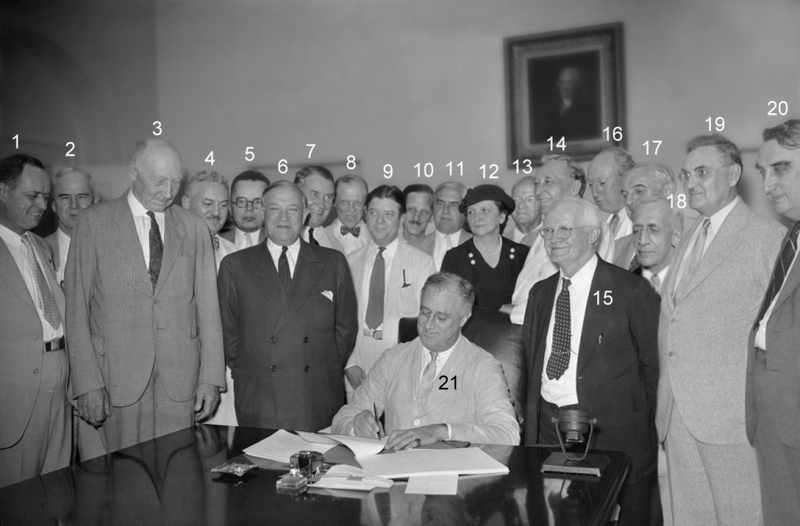 Roosevelt signing the Social Security Act, 1935. See here for names of participants. Courtesy of the Social Security Administration. From: Ratliff BA, U.S. Public Health Service. 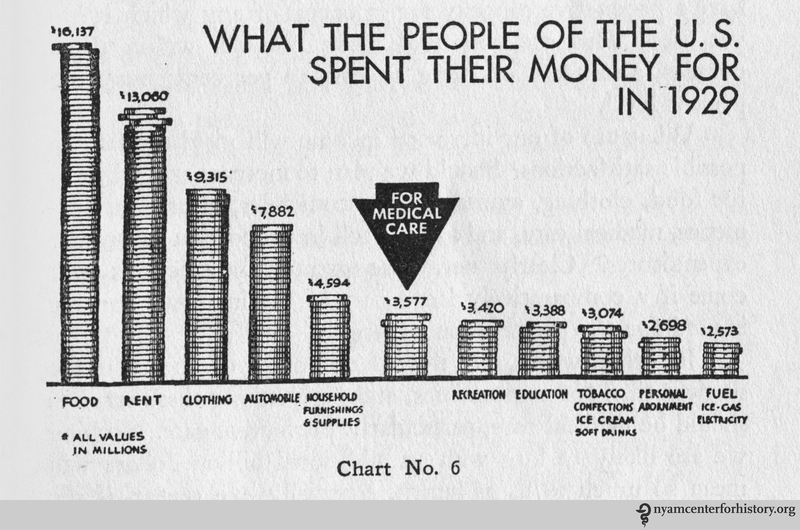 Who Can Afford Health? [New York]: Public Affairs Committee, Inc.; 1939. 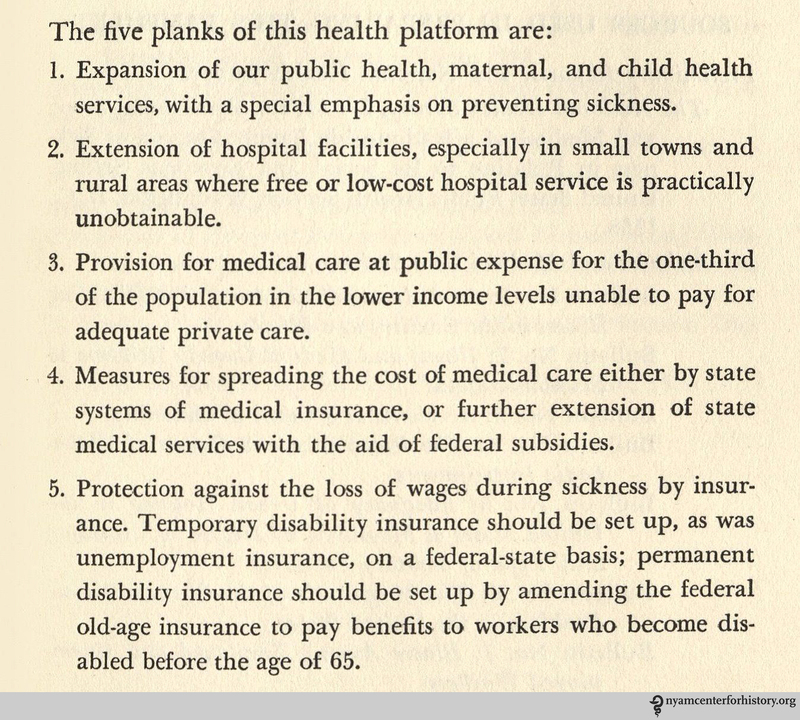 The recommendations were then embodied in the Wagner Bill in 1939, which outlined a broad federal health program. Not surprisingly, the bill was not brought to vote because of the opposition of the AMA and others.7 Subsequent legislative proposals were put forth, but none took hold. In Marmor TR, Marmor JS. The Politics of Medicare. [Rev. American ed.]. Chicago : Aldine Pub. ; 1973. In the early 1950s, the Truman Administration found “the right people” to move a health program forward—older Americans. The aged were sicker, poorer, less insured, and comprised the most hospitalizations. By focusing on this population, the administration hoped it could curb opposition.8 The focus of the program would be on hospitalization rather than on general health insurance. But it would take the next 25 years for the passage of a health law. The Kennedy Administration led the charge in 1961 with the introduction of Medicare legislation, but the majority voted against it. The 1964 election brought a shift in the majority to the Democrats, allowing for further consideration of the bill. 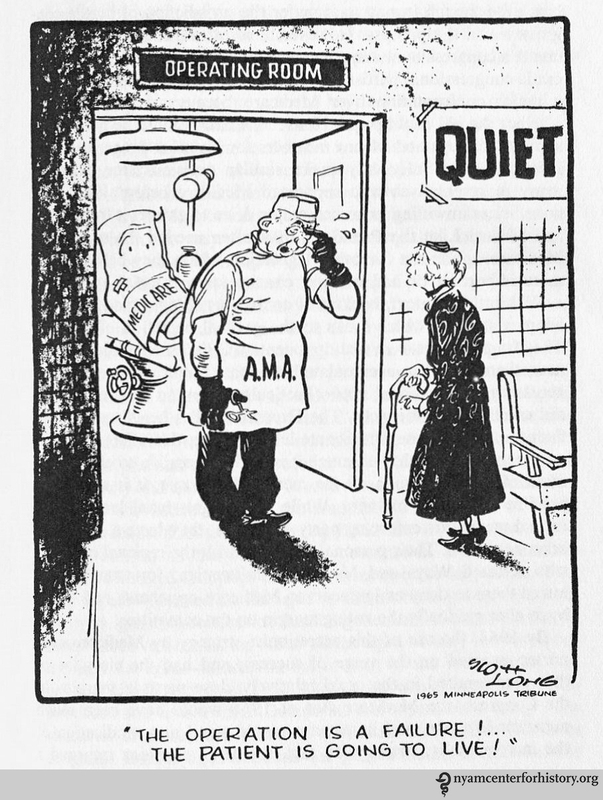 In 1965, with the backing of the AMA and insurance companies, Congress was ready to make a deal. They split Medicare into mandatory Part A: hospitalization, and voluntary Part B: medical insurance. This split helped appease opponents of a national health care system, or what some viewed as “socialized medicine.” Hospital costs were an easy target because hospital bills were large, costs were easier for actuaries to calculate, and patients were more likely to accept help. A portion of the Social Security taxes established by FDR were earmarked to cover the costs of the program and the elderly would pay extra if they opted into Part B.
LBJ signs the Medicare Act (Social Security Amendments) with Harry Truman looking on, 07/30/1965. Courtesy of OurDocuments.gov. In 1967, 19.36 million were enrolled in Part A and 17.87 million took advantage of Part B.9 Today, 55 million people are enrolled in Medicare.10 As the population ages, the economics of the program may need alteration—indeed, the Affordable Care Act has provisions for reforming physician payments and health care delivery. Medicare may need additional modernization in the future to support the population and remain economically viable. But as the history of Medicare shows, life-changing legislation takes time and patience. 1. Foster WT, U.S. Public Health Service. Doctors, dollars, and disease. [New York]: Public Affairs Committee, Inc.; 1937. 3. Myers RJ, McCahan Foundation. Medicare. Homewood, Ill.: Published for McCahan Foundation, Bryn Mawr, Pa., by R. D. Irwin; 1970. 4. U.S. National Health Conference. Proceedings of the National Health Conference. Washington : U. S. Govt. print. off. ; 1938. 5. Ratliff BA, U.S. Public Health Service. Who Can Afford Health? [New York]: Public Affairs Committee, Inc.; 1939. 6. U.S. National Health Conference. Proceedings of the National Health Conference. Washington : U. S. Govt. print. off. ; 1938. 7. Myers RJ, McCahan Foundation. Medicare. Homewood, Ill.: Published for McCahan Foundation, Bryn Mawr, Pa., by R. D. Irwin; 1970. 8. Marmor TR, Marmor JS. The Politics of Medicare. [Rev. American ed.]. Chicago: Aldine Pub. ; 1973. 9. Witkin, E. The Impact of Medicare. Springfield, Ill.: C. C. Thomas; 1971. Laura Robson, the author of today’s guest post, is our 2014–2015 Helfand Research Fellow. She completed her PhD in Classics at the University of Reading, UK. Andreas Vesalius (1514-1564). De humani corporis fabrica libri septum. Basel: Johannes Oporinus, 1543. Click to enlarge. The Fabrica was one of the first anatomical treatises of the 16th century to present illustrations of the anatomised body in a naturalistic way. 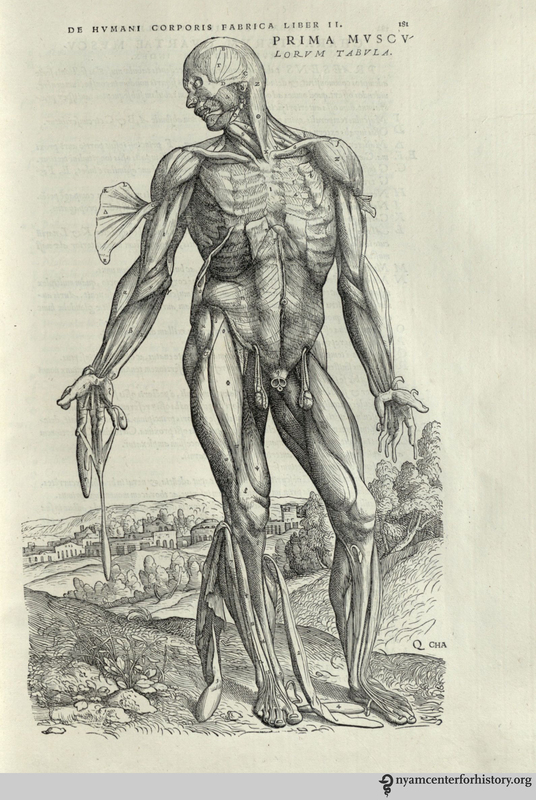 Vesalius promoted the dissection of the human body as the best way to learn about anatomy. 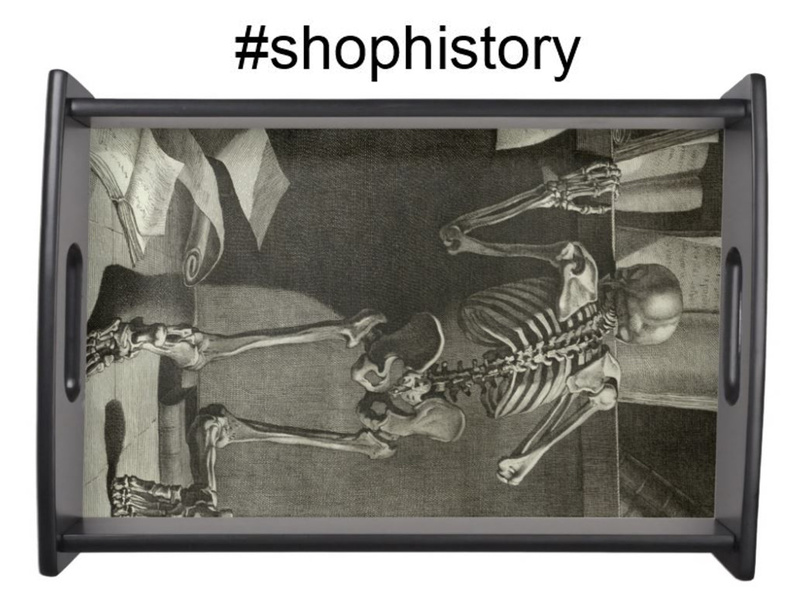 By performing human dissections, he uncovered errors in the work of the ancient anatomist Galen, whose use of animals as dissection material to substitute for the lack of human cadavers had dominated the understanding of the body for centuries. Vesalius was caught in a conflict: how to show the anatomical errors in Galen’s treatises without going against such an important medical authority and potentially damaging his own medical career. He used the Fabrica to present his findings and to build on Galen’s important work. The work Franciscus refers to is in fact Thomas Geminus’ Compendiosa.6 The first edition is predominantly made up of the Latin text of the Epitome and its illustrations, with the addition of many Fabrica figures. It is believed to be one of the first books to use copperplate illustrations.7 Geminus stated in his dedication that he followed Vesalius, but shortened his book to make it more useful to readers, in particular students.8 Reproducing the images of the Fabrica with the text of the Epitome meant that there was little interaction and connection between the two. However, the publication of the Compendiosa did bring Vesalius’ illustrations to a wider audience as the book was shorter and therefore cheaper than the original. In order to make the work more accessible to those who could not read Latin, Geminus published an English edition of the Compendiosa in 1553. Nicholas Udall translated the short captions from the Fabrica figures into English. However, the main text of the Epitome was not translated. Instead the illustrations were placed after the text of Thomas Vicary’s The anatomie of mans body, first published in 1548.9 Geminus rearranged this text to follow the order of dissection for the parts of the body that decayed the fastest—the abdomen, the thorax, and the head. Although the images were not rearranged to fit this order, they connected more strongly to the text than in the Latin edition, as readers were signposted to particular figures discussing different parts of the body. In his preface to the English Compendiosa, Nicholas Udall puts forward some interesting points about the uses of images and texts in medical manuals of his time. He said he did not know whether images or texts were more important when presenting anatomical information. He argued that information is set forth in writing for “high learning” and in pictures for the unlearned. He also explained that surgeons often performed duties like resetting bones by looking at figures alone.10 Surgeons had a low status in the medical profession at this time. They were not university educated like physicians and they were accused of having little knowledge about the science of medicine and healing. This suggests that readers who could not understand Latin, like surgeons, used anatomical figures and not written texts. I believe the English version of the Compendiosa was an attempt at encouraging these readers to read the text as well, by providing it in the vernacular language. 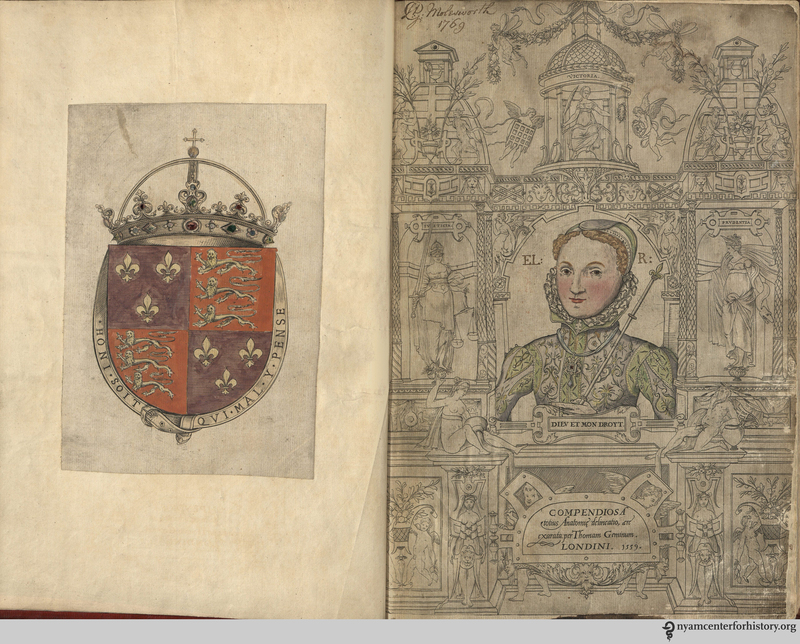 The coat of arms, left, and title page, right, of the Academy’s copy of the 1559 English edition of Geminus’ Compendiosa. Click to enlarge. 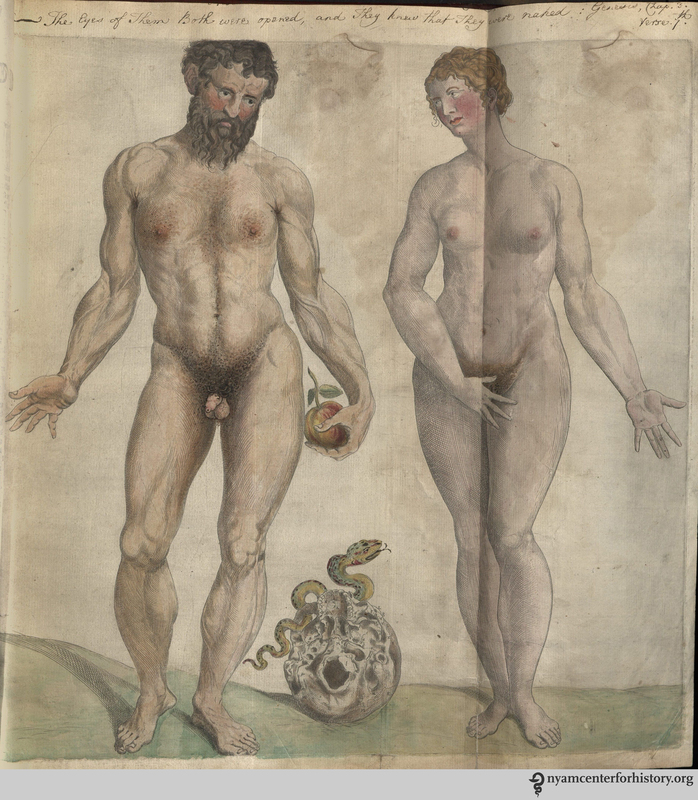 Adam and Eve in the Academy’s copy of the 1559 English edition of Geminus’ Compendiosa. Click to enlarge. Two readers annotated this copy, both with different handwriting from the owner who in 1769 wrote his name—“G. Molesworth”—on the title page. One reader underlined key words and sections of the text, marking these with almost illegible notes in the margins. The other reader, though, focused on the illustrations. This second reader annotated the first three Vesalian musclemen images in the copy, adding the letters of the key, along with the Latin names for the body parts they represent.12 This English edition of the Compendiosa seldom uses the Latin names for parts of the body. So our reader did not get the information for his notes from this edition of the text. He must have consulted another text, such as the Latin edition of 1545, or even the original work of Vesalius’ Fabrica, in order to make his annotations. The annotated muscleman figure in the Academy’s copy of the 1559 English edition of Geminus’ Compendiosa. Click to enlarge. This demonstrates the culture of active reading in the early modern period. This reader engaged with more than one treatise, perhaps even several works, when learning about the dissection of the body. He was familiar with the Latin language, and was therefore not one of the unlearned readers mentioned by Nicholas Udall in his preface to the work. While Andreas and Franciscus Vesalius opposed the reproduction of the Fabrica and Epitome, the works that copied, adapted, and reused material from these texts allowed for the transmission of Vesalius’ knowledge of the body to a wider audience than the original works could reach. And this new audience interacted with the material, coming to a greater understanding of the dissected human body in the early modern period. 1. Andreas Vesalius (1546), Vesalius: The China Root Epistle, translated by Daniel H. Garrison (2015), p. 6. 2. Andreas Vesalius (1543a), De Humani Corporis Fabrica Libri Septem, Basel and Andreas Vesalius, (1543b), Andreae Vesalii Suorum de Humani Corporis Fabrica Librorum Epitome, Basel. 3. 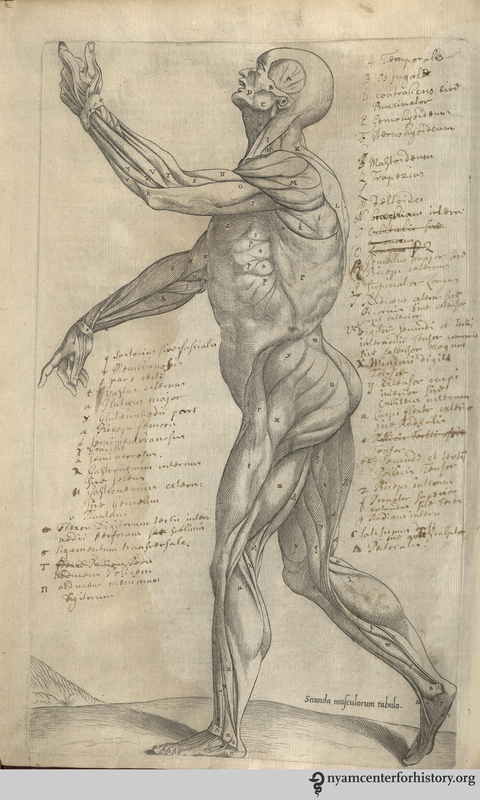 On active reading in Vesalius’ anatomical texts see, Nancy Siraisi (1994), “Vesalius and Human Diversity in De humani corporis fabrica”, in Journal of the Warburg and Courtauld Institutes, Vol. 57 p.64 and Sachiko Kusukawa (2012), Picturing the Book of Nature: Image, Text, and Argument in Sixteenth-Century Human Anatomy and Medical Botany, Chicago and London, p. 24. 4. On history of copyright and pirating see Christopher L. C. E. Witcombe (2004), Copyright in the Renaissance: Prints and Privilegio in Sixteenth-Century Venice and Rome, Leiden. 5. See Charles O’Malley (1955), “The Relations of John Caius With Andreas Vesalius and Some Incidental Remarks on the Guinta Galen and on Thomas Geminus,” in Journal of the History of Medicine and Allied Sciences Vol. 10.2 pp.147-172. 6. Thomas Geminus (1545), Compendiosa totius anatomie delineatio, aere exarata: Thomam Geminum, London. 7. Leroy Crummer (1926), “The Copper Plates of Raynalde and Geminus”, in Proceedings of the Royal Society of Medicine Vol 20.1 p. 53. 8. Thomas Geminus (1545), Compendiosa totius anatomie delineatio, aere exarata: Thomam Geminum, London, p. 1. 9. Thomas Vicary (1577 ), A Profitable Treatise of the Anatomie of mans body: compyled by that excellent chirurgion, M. Thomas Vicary esquire, seriaunt chirurgion to king Henry the eyght, to king Edward the. vj. to Queene Mary, and to our most gracious Soueraigne Lady Queene Elizabeth, and also cheefe chirurgion of S. Bartholomewes Hospital. Which work is newly reuyued, corrected, and published by the chirurgions of the same hospital now beeing, London. 10. Thomas Geminus (1553), Compendiosa totius anatomie delineatio, aere exarata: Thomam Geminum, London, p.1. 11. Thomas Geminus (1559), Compendiosa totius anatomie delineatio, aere exarata: Thomam Geminum, London. 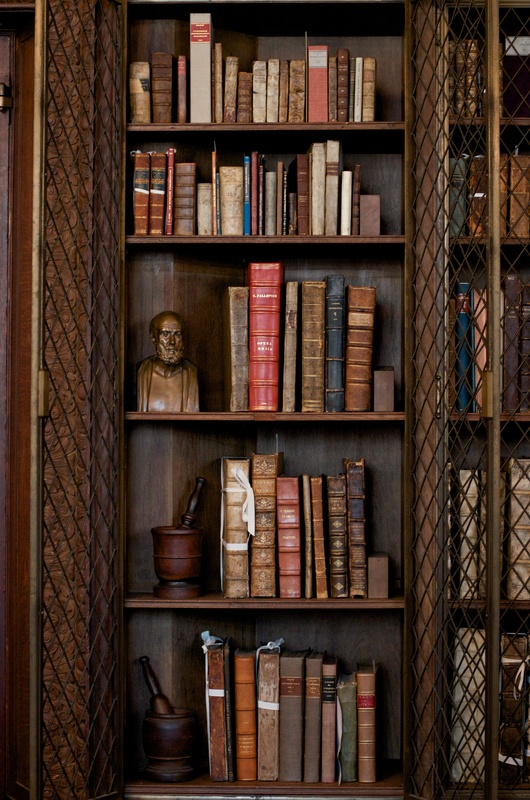 Every library is likely to find parts of its collection in need of protective enclosures and unique storage solutions. As part of our responsibility for the physical care of the collections at The New York Academy of Medicine, staff in the Gladys Brooks Book & Paper Conservation Laboratory routinely engages in large-scale rehousing projects. 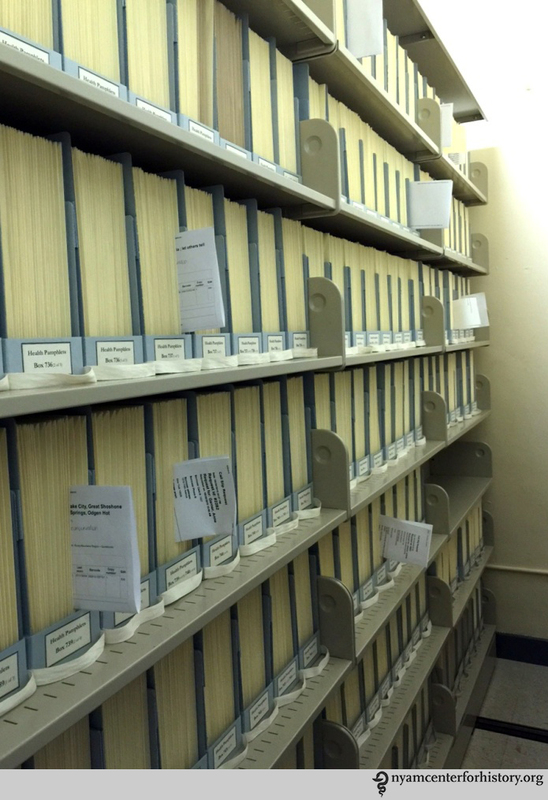 One such project currently underway is rehousing the library’s Health Pamphlet Collection. We estimate the project will take up to three years to complete. The Health Pamphlet Collection consists of 19th– and early 20th-century health-related publications in many languages. It covers a wide range of topics, such as nutrition, proper hygiene, exercise, as well as medical innovations and research. A damaged document box housing health pamphlets. Approximately 50,000 health pamphlets are currently housed in acidic envelopes or plastic bags. These are in oversized boxes too big for the compact shelving unit on which they are stored. This limits accessibility, as the compact shelving cannot move properly, leaving little room for a librarian to retrieve each box from the shelf. In addition, each box is heavy and overstuffed with materials. This puts the pamphlets at risk of damage during storage and retrieval, and is problematic for staff who have to move and transport heavy boxes for patron use. 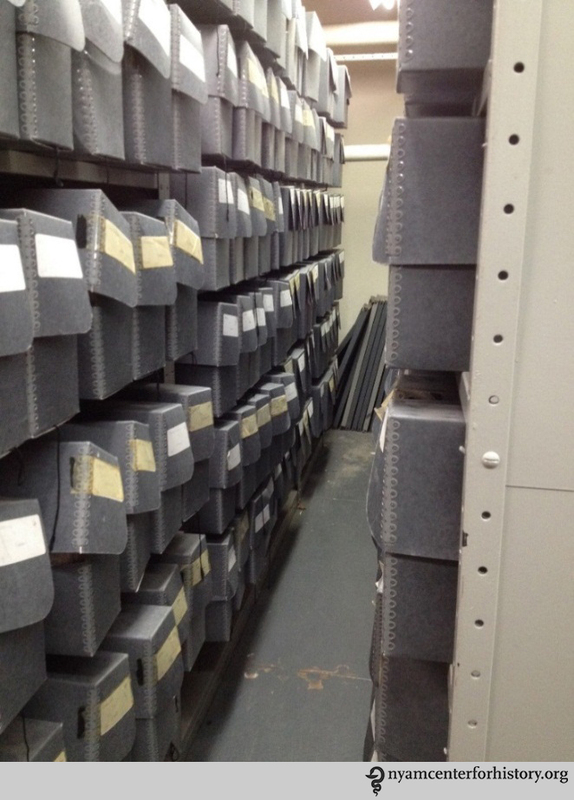 Previous storage space, with overstuffed document boxes. 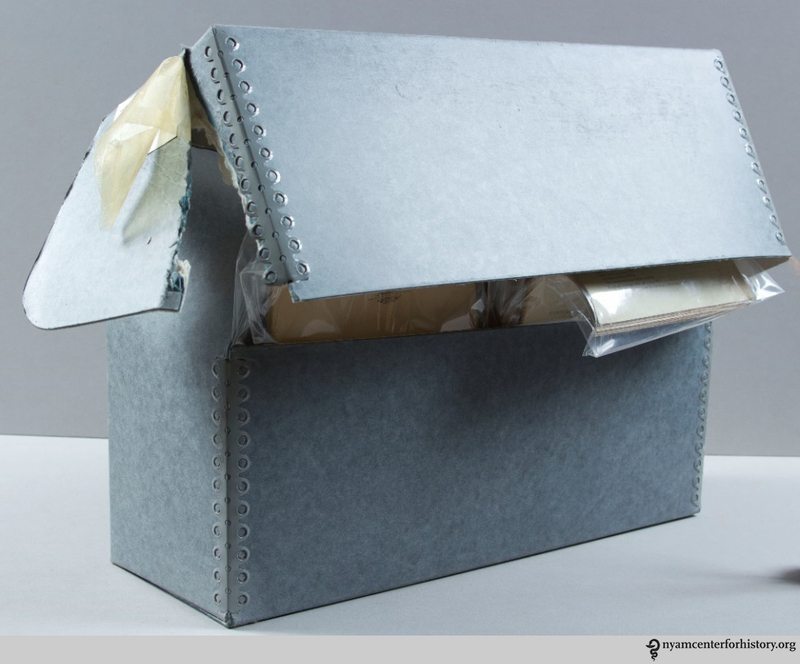 As part of the rehousing efforts for this collection, staff members place each pamphlet in an archival envelope with a 10-point folder stock insert for additional support, and then into a custom-made enclosure. The design of the enclosure is borrowed from the New-York Historical Society Library’s conservation laboratory. It is economic, sturdy, easy to make, and most importantly allows for safe and easy access to the collection. The process of rehousing a collection involves more than simply making new enclosures and moving items to a new space. In order to make the Health Pamphlet Collection more accessible, staff members also dry clean each item with soot sponges—absorbent vulcanized rubber dirt erasers— and assess them for other conservation treatment needs, which they record in a spreadsheet to address as needed over time. In addition, a volunteer is creating an accurate inventory of all of the pamphlets to aid in future cataloging updates. The Health Pamphlet Collection contains a wealth of information for researchers; through this project, conservation staff hopes to guarantee its accessibility to patrons both today and for generations to come. 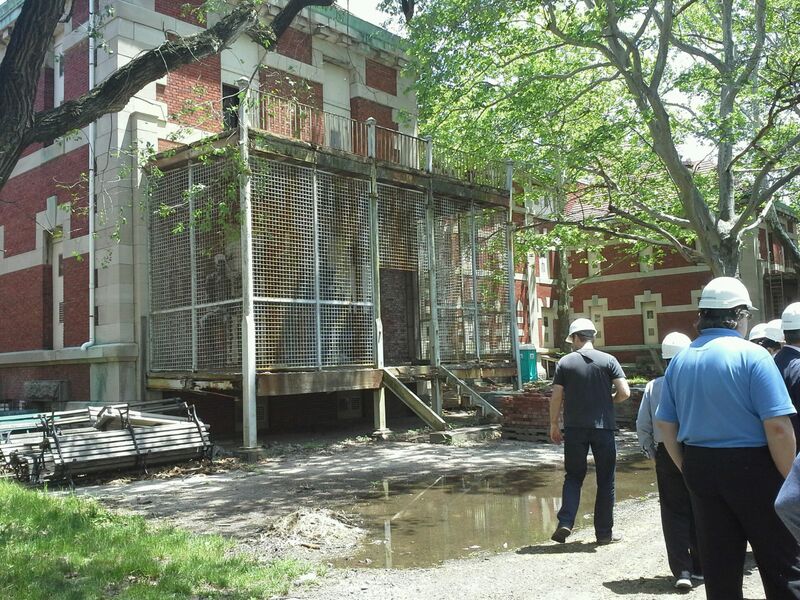 On June 7, our Friends of the Rare Book Room and ARCHIVE Global: Architecture for Health enjoyed a private visit to the hospital zone on Ellis Island. The private support group Save Ellis Island offers hardhat tours of the hospital complex, which is adjacent to the main reception center operated by the National Park Service. 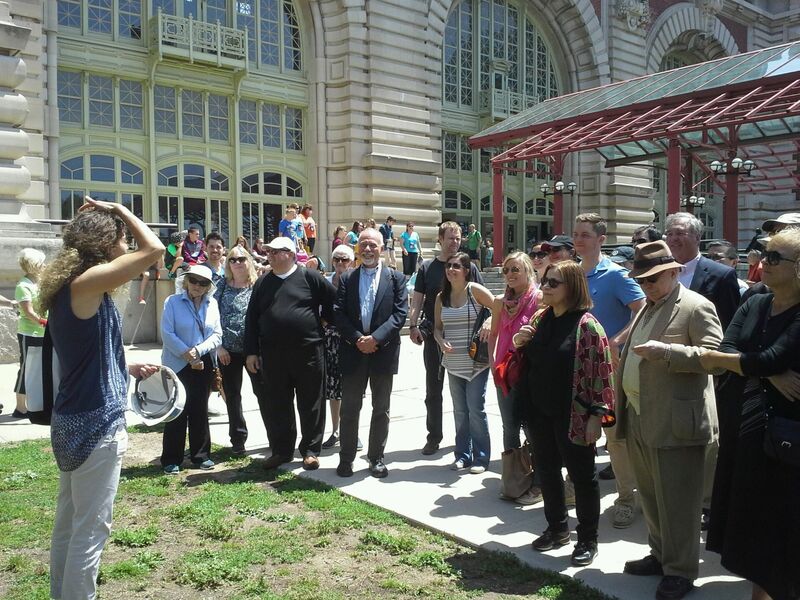 More than 30 people took the ferry from Battery Park across New York Harbor to Ellis Island to learn more about the site and its importance to the history of public health in New York City. Some stayed on for lunch afterward at historic Fraunces Tavern. 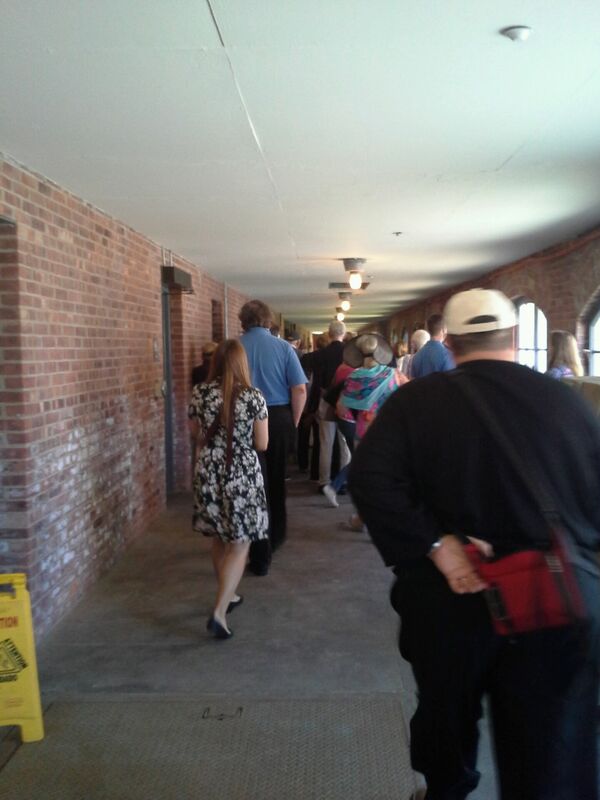 Our Save Ellis Island tour guide gives safety instructions before the group enters the hospital zone. On the south side of the island, and out of use since 1954, the hospital complex housed would-be immigrants who were not permitted to immediately enter the country. All steerage passengers were inspected—usually for only a few seconds, given their great numbers—and some 1 to 2% were detained for health reasons. 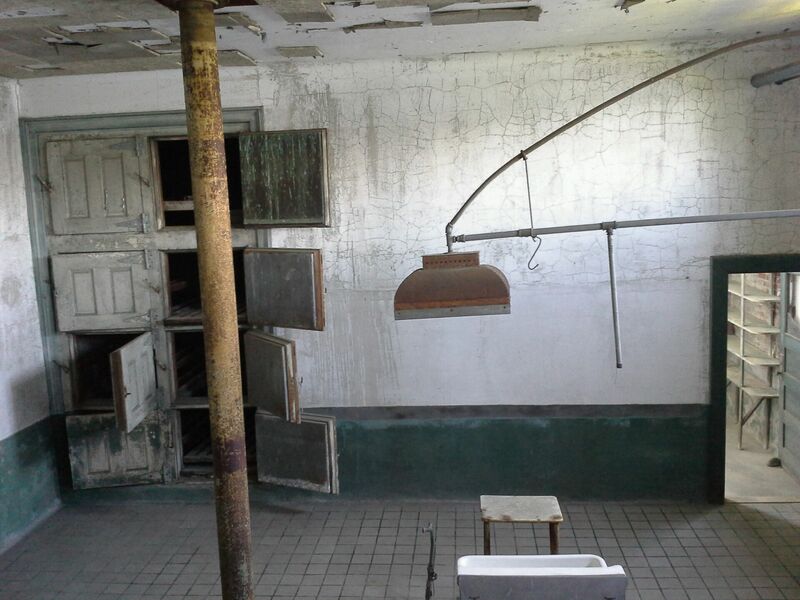 Completed in 1909, the 750-bed hospital included wards for infectious diseases, kitchens, massive laundry facilities, an autopsy room, and recreation spaces for patients and staff alike. Even in its semi-derelict condition, the complex is one of the few remaining “pavilion” style hospitals in the country. Pavilion hospitals were first built in France in the 18th century, and were enthusiastically endorsed by reformers such as Florence Nightingale in the 19th century. The design emphasized the need for ventilation, with wards built to promote sanitary conditions, provide light, and maximize the circulation of air. Pavilion hospital design fell out of use in the 20th century. Caged verandas allowed patients access to fresh air while controlling their movement around the complex. Wall with a tide mark showing the level of water during Hurricane Sandy. We are increasingly offering our Friends group exclusive events such as this visit. If you are interested in becoming a Friend, find out more here. Friends who missed out on this sold-out event should e-mail culturalevents@nyam.org to express their interest in another tour at a later date. Are you working on a history of medicine project that would be enhanced by spending a month mining our collections? We are now accepting applications for the Paul Klemperer Fellowship in the History of Medicine and the Audrey and William H. Helfand Fellowship in the History of Medicine and Public Health. Each fellow receives a stipend of $5,000 to support travel, lodging, and incidental expenses for a flexible period between January 1, 2016 and December 31, 2016. Fellows are expected to spend at least four weeks in New York City, working at The New York Academy of Medicine. Besides completing a research project, each fellow will be expected to make a public presentation at the Academy and submit a final report. Both fellowships are designed to support researchers who can demonstrate how an opportunity to immerse themselves in our rich holdings will enhance their work. Preference in the application process is given to early career scholars, although the fellowships are open to anyone who wishes to apply, regardless of academic status, discipline, or citizenship. While both fellowships are for researchers engaged in history of medicine projects, the Helfand Fellowship emphasizes the role of visual materials in understanding that history. The application deadline is Monday, August 17, 2015. Letters of recommendation must be received by Friday, August 21, 2015. Fellowship recipients will be notified by Thursday, October 1, 2015. Perspective applicants are encouraged to contact Arlene Shaner, Reference Librarian for Historical Collections, at 212-822-7313 or history@nyam.org with questions or for assistance identifying useful materials in the library collections.